France, 1987, 104 minutes, Colour. 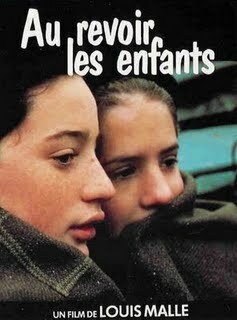 Au Revoir, Les Enfants is a very moving film about World War Two and occupied France. It was written, produced and directed by celebrated director Louis Malle. It is autobiographical: Malle was at school at this period and says he remembers an incident like this. However, he has dramatised and interpreted it. Nevertheless, one can experience the personal investment that Malle has made in this film. Malle was one of the New Wave directors beginning a career in the early'609. He was successful with such dramas as The Lovers and such comedies as Zazie in the Metro. In the mid-'60s he made such films as Viva Maria and the series Phantom India. During the '70s he made such celebrated films as Murmur of the Heart, Lacombe Lucien (with the same setting as this film). He moved to the United States in the mid-'70s and made Pretty Baby, Atlantic City, My Dinner With Andre, Alamo Bay. The film is a moving presentation of people in occupied France. It focuses on the Jewish theme and refuges and their being sheltered by Catholics. The presentation of the Catholic school is both robust and sympathetic. It is a fine ecumenical gesture and a film about brotherhood and peace. 1. The impact of this film: the war experience, children, peace, shelter? 2. The work of Louis Malle, the relationship of this film to his previous films? Oscar nomination, acclaim? 3. The film as autobiographical: remembered, felt, interpreted? Malle's own words at the end of the film? 4. France 1944: the winter, occupied France, the towns, the countryside, the school? Authentic atmosphere? Decor and costumes? The musical score, the sense of period, the choral work? 5. The title: Jews, the war, the inevitability of the farewell: especially for Jean? A film of rights of passage for Julien? For the boys in the school? 6. The introduction to Julien: the times, his dependence on his mother, his absent father, his older brother? Love and hate? Going back to school, his peers, the walks, the dormitory, his being wilful, a leader, dominating others, good student, continually reading, shrewd? The setting up of the situation for his encounter with Jean? 7. The life of the school: the Carmelites and their religious spirit, prayers, Mass, confessions? The boys walking, recreating? Classes Peguy, algebra, geometry, Latin and Greek, continued during the raids? the variety of teachers and their style in class? The scenes in the dormitory, Julien and the wetting the bed? The meals and the sharing of the food? The recreation in the yard, the boys waiting on the strangers, the recreation on stilts, the fights? Attention to details of period? 9. The focus on the two boys, rivalry, fighting, friendship? Lost at the treasure hunt and being brought home by the Germans? Jean going to the restaurant with the family? Julien asking about his name, looking at his books? The Gestapo arriving? Julien giving him away with the look, Jean forgiving him? Tracing the growth of the friendship, ups and downs, boys of that age? The bonds between the two? 10. The picture of the rector, his running of the school, sternness, his care for the boys, the strong homily against the rich and the rich man walking out, his concern for justice and truth, his sheltering the Jewish boys, the sacking of Joseph unwillingly, his arrest? 11. The sketch of the staff: priests, the lay teachers, the various courses, the piano-teacher, the episode of watching Charlie Chaplin's The Immigrant and the delight of the film? The yearning for freedom with the Statue of Liberty? fee staff; helping the Jews, the teacher trying to shelter the Jews and escaping over the roof? The nun and her fear, giving the boys away? 12. The cooks and their fighting, Joseph, his giving away the stamps and getting food, the black market, his being exposed, his giving the names of the boys, the rector reprimanding them, the irony of Joseph joining the collaborators and betraying them? 13. The Nazis in the background, Marshall Petain, the boys and their attitudes towards the occupation and the Germans? The importance of the restaurant scene, the mother, the sons, the collaborators accusing Myer of being Jewish and trying to oust him from the restaurant? The Nazis showing off and letting him stay? The Germans and the Catholic Bavarians? Bringing home the lost boys? The SS and their search for the Jews, the arrests, the closing of the school? 14. The sketch of Julien's mother, her love for her son, concern, vanity? Presents and letters? The meal and her attitudes - summing up the attitudes, especially towards the Jews, of the French? Julien's brother and his giving wrong directions to the Germans? 15. The film's attention to detail: the classroom, dormitories, meals, sharing, the film, the walk, treasure hunt? 16. The impact of the ending? What were audiences left with? A memoir of the '40s by a mature man of the '80s?